1 of 6 In a large bowl, blend butter and sugar with an electric mixer on medium-high speed until fluffy. Add egg yolk and vanilla; beat until incorporated. On low speed, add flour; mix until dough comes together in a ball. 2 of 6 Divide dough into 3 pieces; shape into discs. Wrap each in plastic; refrigerate for at least 2 hours and up to 2 days. 3 of 6 Heat oven to 375 degrees F. Line two large baking sheets with parchment paper. 4 of 6 Crush candies (keep colors separate) in a food processor until finely ground. Transfer to two small bowls. 5 of 6 Remove one piece of dough from the refrigerator and knead it on a lightly floured work surface to soften. With a lightly floured rolling pin, roll out dough to 1/8 to 1/4 inch thick. 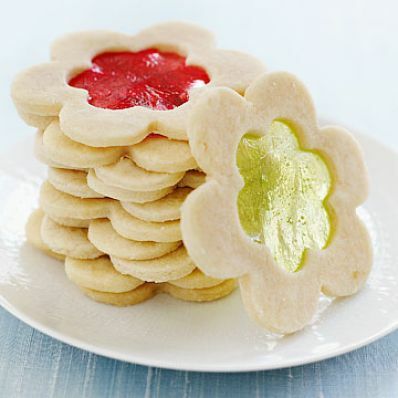 Cut out shapes with a 3-inch cookie cutter. Place on baking sheets and cut out center of each cookie with a 1-1/4-inch cutter. Refrigerate scraps. 6 of 6 Using a very small spoon, carefully fill each cutout with candy so it is resting on the parchment paper and is level with the dough (about 1 teaspoon in each). Bake at 375 degrees for 8 to 10 minutes or until firm and golden. Cool completely on baking sheets. Repeat with the remaining dough, then chilled scraps, using fresh parchment each time. Store at room temperature in an airtight container for several days. Makes about 36 cookies. Per Serving: 3 g sat. fat, 19 mg chol., 5 g Fat, total, 0 g fiber, 2 mg sodium, 11 g carb., 1 g pro., 94 kcal cal.